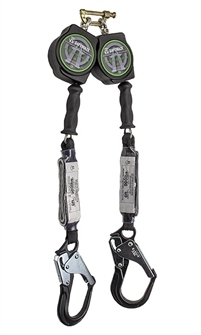 Class A Double retractable that meets the newest ANSI Z359.14 standards! Safewaze™ retractable lifelines are designed to be used as a single person fall protection device.The SW-8008-10-ALU-RBH-DL features mobility-enhancing swivel-tops, rugged and durable housings, and a unique braking system that eases shock in the event of a fall. Maximum Arresting Force: < 1,800 lbs; Avg Force < 1350 lbs. Carabiners come undone when climbing ladders. I got for 3 of my employees and all had problems with their carabiners coming undone.